Home > News & press releases > Has your partner suffered a brain injury in the last decade? Has your partner suffered a brain injury in the last decade? If your spouse or partner has suffered a brain injury in the last 10 years, whether the result of a traumatic injury, stroke or brain tumour, and you are currently living together, a University of Birmingham research project would welcome your input. Researchers are looking into how caring for a partner with brain injury affects the relationship between spouses. 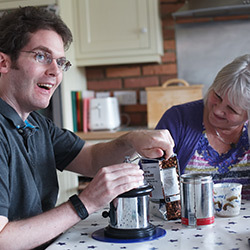 The purpose of the research is to identify factors that help to maintain a strong marital relationship even after a severe brain injury to help increase the quality of life of the carer and the quality of the relationship. If you are able to take part in this valuable research project, contact clinical psychologist Natasha Yasmin; you will receive a package of questionnaires through the post that should take no more than an hour to complete. You will also receive a £10 Amazon voucher to thank you for participating. To take part or to ask further questions, contact Natasha at [email protected] or call 07438 895425. Research subjects must be identified within the next six weeks. If you know someone who may be able to assist the research, please pass this request to them.